To most observers, American Jewry is divided into three flavors, not unlike Neapolitan ice cream. There is the very traditional branch, Orthodox, that faithfully maintains the old ways and language; its newer and somewhat livelier offshoot, Chabad, operates a growing number of small storefront-type religious centers in rented spaces in many cities. On the other end is Reform, which is a modernized and far more assimilated branch in which English is used for the liturgy and men tend not to wear yarmulkes on their heads. In the middle is the Conservative branch, which does not refer to political orientation but to its addition of modernizations while still conserving tradition and using more Hebrew than Reform. A lesser number Jews belong to an offshoot, Reconstructionist Judaism, which embraces traditions but modernizes or de-emphasizes certain beliefs and meanings. Even within American Jewry, many are unaware that there is another, newer and somewhat offbeat variant: Jewish Renewal. It’s a loose-knit term for a variety of small congregations that grew out of the 1960s, in an attempt to entice disaffected Jewish college students back to their roots. The very name of a seminal congregation in Berkeley, the Aquarian Minyan, speaks to its Woodstock-generation origins. 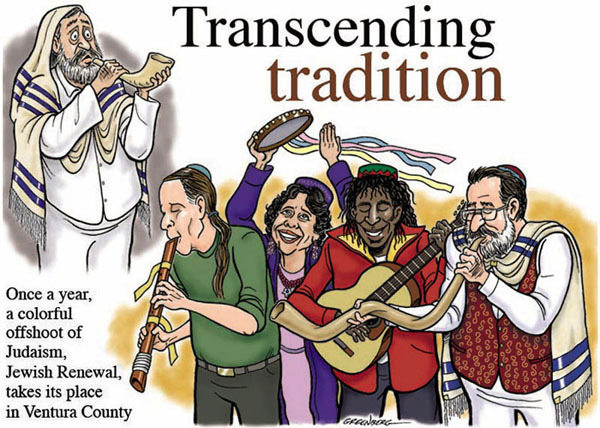 Jewish Renewal is a catch-all name for the movement, although individual congregations vary from meditational to musical to politically-involved. Typically, they mix a hodgepodge of folk music, chanting and traditional liturgy, have meditational elements (and sometimes even Buddhist ones), encourage congregants’ participation (often playing drums or rhythm instruments) and lack permanent buildings. Women are full equals and services may be lay-led or rabbi-led. If “regular” Judaism is like Neapolitan ice cream, Jewish Renewal is more like Ben & Jerry’s Cherry Garcia. In Los Angeles, with the nation’s second-largest Jewish population, there are only two Renewal congregations: B’nai Horin (Children of Freedom) in West Los Angeles. and Makom Ohr Shalom (Place of Light and Peace) in Tarzana, plus one in Long Beach. Santa Barbara has one congregation that does a monthly Renewal-style service. Ventura County has none at all… well, most of the time. Once a year, B’nai Horin arrives on the scene to do a set of full-fledged Jewish Renewal High Holidays services, then vanishes again from the county for another year. The Brandeis-Bardin Institute, on the southern edge of Simi Valley, is a Jewish educational outreach center off of Tapo Canyon Road that runs camps for children and programs for adults. It holds basketball camps and nature walks, hosts an Elderhostel and acts as a woodsy setting for retreats and spiritual events. B’nai Horin has been coming here since 1991 to do its Rosh Hashana and Yom Kippur services. During the regular year they meet monthly at a private home in West LA, but the need for a larger facility for four services — many Jews go to synagogue only during the High Holidays — and the away-from-it-all feeling of the Brandeis facility draws them the many miles farther during this time. After examining alternatives in Malibu and other locations, he picked Brandeis-Bardin and Simi as the most inviting, citing its “magnificent sanctuary,” its availability as a kosher facility where more orthodox members could stay overnight, and its natural beauty where walking or hiking could become part of the spiritual journey. “When I saw it I thought, wow, this is a whole different space,” said Levy. At Rosh Hashana, the Jewish New Year, about 400 individuals, ranging in age from 20 to 80 but mostly in the Boomer generation, attend the Simi Valley services. Their preferred location on the Brandeis-Bardin campus, the House of the Book — a stone building built in the shape of a Torah — was damaged in the 2005 fires that touched Simi Valley and Chatsworth, and another sanctuary was substituted last year, which congregants enjoyed enough to return to this year. Rabbi Levy, a man of warmth and strong convictions is, in his day job, an attorney and partner with the LA law firm of Manatt, Phelps & Philips LLP. If being an attorney and a rabbi seem mutually contradictory, it helps to know that Levy was a civil rights and public service lawyer, served as Deputy Director of the Western Center on Law and Poverty, represented labor, health and safety laws and now oversees Manatt’s pro bono cases. He is also a co-founder of The Academy of Jewish Religion, a rabbinical and cantorial seminary near UCLA. From 1976 through 1983, Levy produced albums and concerts and represented a number of clients in the music and recording industry. This might help explain why B’nai Horin services showcase a variety of noted Jewish musicians. Its biggest headliner, Debbie Friedman (skipping this year’s service) is an internationally-renowned composer and singer of contemporary Jewish folk music and, not coincidentally, a legal client of Levy. Other musicians apt to show up include David Zasloff, a stand-up comedian and versatile jazz musician, Bruce Burger, known on the concert circuit as “RebbeSoul,” Richard Hardy, who plays Native American flute and other instruments, singer and guitarist Stefani Valadez, peace-song composer Stephen Fiske, cantorial soloist Lynda Levy, the rabbi’s wife, and, easily the most noticeable person in the room, Alula Tsadik, a dreadlocked Ethiopian immigrant who plays a variety of instruments. Two years ago actor Theodore Bikel showed up to sing and tell stories at a Rosh Hashana second-day gathering. Hardy, a Thousand Oaks resident, has been playing at the B’nai Horin services for about twenty years. A classically trained sax, horns, flute and woodwinds player who has performed with the Denver Symphony, Dave Mathews, Stevie Ray Vaughan and others, he was invited by fellow musician Fiske to play a gig with Carole King, after which Fiske invited him to come by his congregation, B’nai Horin, and play. The Jewish Renewal movement is largely the creation of Rabbi Zalman Schachter-Shalomi, now 82 — who joins with the other local renewal congregation, Makom Ohr Shalom, each Rosh Hashana — and the late Rabbi Shlomo Carlebach, a musician and Jewish songwriter. The two, who came from Hassidic and Orthodox movements respectively, encouraged young Jews who had become hippies to re-embrace their Jewish heritage in the 1960s. The rabbis’ new offshoot drew from Jewish mystical traditions as well as meditation, dance, chant, and feminism. Their goal was to re-energize — or renew — Jewish practice making it more inclusive, experiential, and compelling. Social and environmental action underscore its emphasis on relevance, but attention is also paid to traditional interpretations of Torah portions and attempts are made to connect ancient meanings with modern events. Many congregants come from non-Jewish backgrounds, and Renewal congregations are more forgiving of mixed marriages than other branches; it’s not unusual to see an occasional black or Asian face in the gathering. Detractors of the movement dismiss it as “New Age,” touchy-feely, flaky or just plain weird, but many of its devotees wouldn’t be caught in a mainstream synagogue and might otherwise be lost to the religion. Jewish Renewal High Holiday services tend to be much livelier than their more conventional counterparts. B’nai Horin’s lineup of performing musicians would be seen as highly inappropriate by the Orthodox branch, but is a key part of its identity. The prayers and music range from the traditional to the contemporary. When the music starts is when the congregation finds its groove. Levy often will chant, eyes closed and arms outstretched as the musicians join in and others in the seats add the rhythms of whatever drums or shaken instruments they may have brought. Northridge resident Joy Krauthammer often plays the timbrel, a biblical variant of the tambourine used by women. Often individuals will stand up and start dancing around, and sometimes will join hands in a hora line that snakes up and down the aisles. The music might continue for several minutes and the effect, when things are clicking, can be transcendental. Eventually, the musical destination will be the shofar service, a cornerstone of the High Holidays. The shofar is a notoriously difficult instrument to play. It’s not unusual to see the blower’s face turn beet-red with effort as a wobbly, bleating note finally emerges, often to the giggles of those assembled. Not so for Joshua Levy, who as a master Shofar player once player Shofar in a Ska band and plays each note in the High Holyday services with great power and great ease, often in the style of John Coltrane. Ska band? Coltrane? Try finding THAT in a conventional High Holiday service. Apparently, only in Simi Valley. Learn more about Steve at his web site: Steve Greenberg Art. The material on this page except for photographs was created by Steve Greenberg and is copyright by Ventura County Star, and may not be reposted, reprinted or reused without permission.